You likely have heard of a larynx but do you know what a pharynx does and where it is? The larynx is what most people call the throat. It is a semicircular tube made of fibro muscle with a length of about 4 or 5 inches. But what is the function and definition of the pharynx? 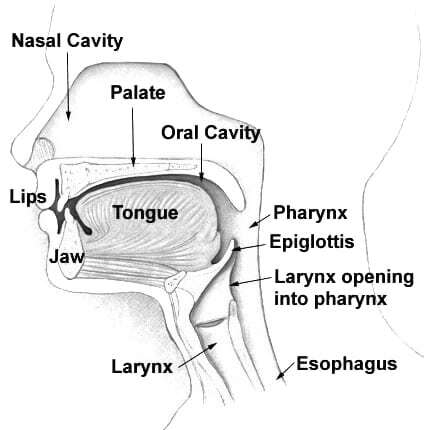 The larynx connects the oral cavity to the esophagus and the nasal cavity to the larynx. In this article, we will go over everything that there is to know about the pharynx. The first thing to know about the pharynx is its location. The pharynx is below both the oral and the nasal cavities (the mouth and the nose), and just above the larynx and the esophagus. 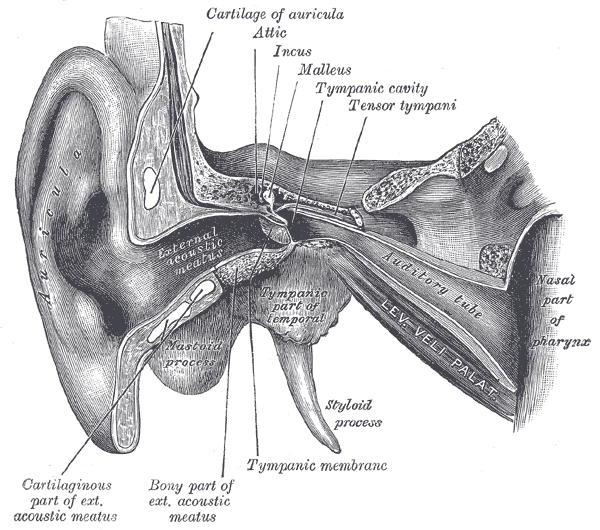 The pharynx extends all the way from the base of the human skull to the lower end of the cartilage known as the cricoid. What Are The Parts of the Pharynx? The pharynx is divided into nasal, oral, and laryngeal sections. 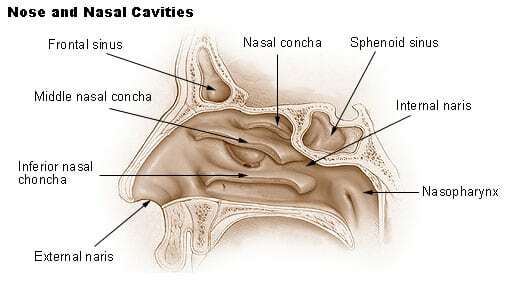 The nasal section is called the nasopharynx or nasal pharynx. It is the uppermost section of the pharynx, between the soft palate and the base of the human skull. The nasal pharynx is the home of the pharyngeal tonsils and the adenoids, which are on the posterior wall. The oral section is called the oropharynx or oral pharynx. It is the part that comes after the nasal pharynx, behind the tongue base, between the epiglottis and the soft palate. The laryngeal section or laryngopharynx (also known as the hypopharynx) is the last section. It is located between the cricoid cartilage and the epiglottis, and connecting to the esophagus and the larynx. What Are the Muscles in the Pharynx? There are several muscles in the pharynx that can generally be divided into two different structures: the outer circular layer and the inner longitudinal layer. The outer circular layer is made up of three incomplete circular muscles that are innervated by the vagus nerve or nervus vagus. These three muscles are the superior pharyngeal in the oropharynx, the middle pharyngeal constrictor in the laryngopharynx, and the inferior pharyngeal constrictor also in the laryngopharynx. The inferior pharyngeal, itself, is divided into superior and inferior components. The superior component is attached to the thyroid cartilage by some oblique fibers. The inferior component is attached to the cricoid cartilage by some horizontal fibers. The next layer of muscles is the inner longitudinal layer. This layer has three muscles that run along the pharynx. They are the stylopharyngeus that extends from the styloid process to the pharynx, the palatopharyngeus that extends from the hard palate in the oral cavity, and the salpingopharyngeus that goes from the inferior cartilage of the Eustachian tube. There are also several nerves that innervate the different muscles. The vagus nerve in the salpingopharyngeus and the palatopharyngeus, and the glossopharyngeal in the stylopharyngeus. How About the Supply of Blood? Blood is supplied to the pharynx through the following arteries (external carotid arteries): lingual artery, pharyngeal artery, maxillary artery, and facial artery. Then, blood is drained into the internal jugular vein (IJV) by the venous pharyngeal plexus. What Are the Functions of the Pharynx? Now that we have gone over all the different components of the pharynx, let us look at the functions. The pharynx has a double function. It is a key part both for the digestive system and the respiratory system. 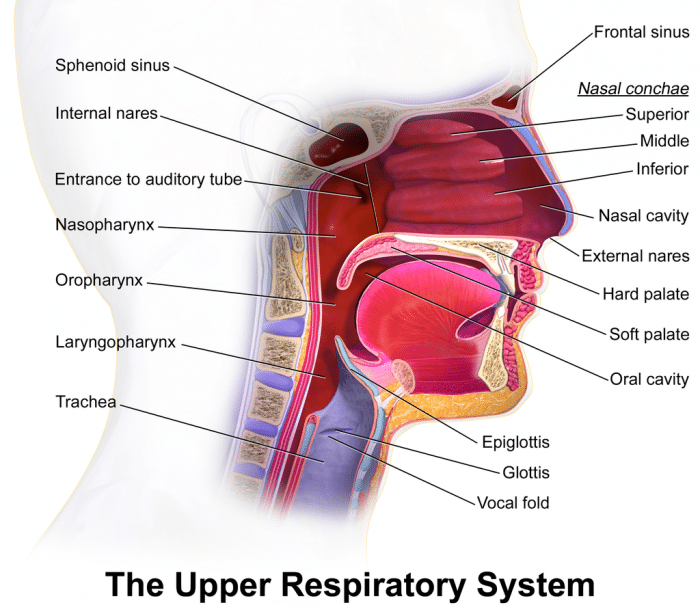 When it comes to the respiratory system, the purpose of the pharynx is to allow the air that has been inhaled through the nasal cavity all the way down to the lungs, through the larynx and the windpipe. 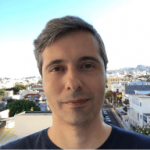 There is a passage that connects both the nasal and the oral pharynges, known as the isthmus. It is thanks to that isthmus human beings can breathe both through the mouth and the nose. But because the pharynx also has a key function in the digestive system, there needs to be something in place that would stop air from entering the digestive system. This is prevented thanks to the epiglottis, which is located at the very end of the oropharynx. Another key part of the respiratory system is the eustachian tubes that connect the pharynx and the middle ear, thus helping to equalize the air pressure in the eardrum. When it comes to the digestive system, the pharynx helps the ingested food to go into the esophagus through the lumen. This is thanks to the circular muscles in the pharynx and their contractions. But that is not all, there is also the longitudinal muscles that widen the pharynx and elevate the larynx, thus allowing swallowing. Although the breathing and the digestive functions are key, the pharynx also plays an important role in speech, always in conjunction with other speech muscles and organs. This role is twofold: on the one hand, the pharynx helps us make the initial sounds in speech, but it also works as a resonating organ. Tonsillopharyngitis: a viral infection that causes difficulty swallowing and pain. Pharyngitis: swelling of the pharynx. It is painful, particularly when swallowing. It causes redness and the appearance of white patches. Pharynx cancer: this condition causes a lumpy feeling in the area, throat and ear pain. It may result in deafness. Throat paralysis: this can happen as the result of one of several infectious diseases, polio, rabies, or diphtheria being the most common of them. Laryngopharyngeal reflux (LRP): stomach acid gets all the way up from the esophagus to the throat. Pharynx cobblestoning’: this happens as a result of allergic rhinitis.